Coconut Sweet Potato Lentil Soup with Rice. 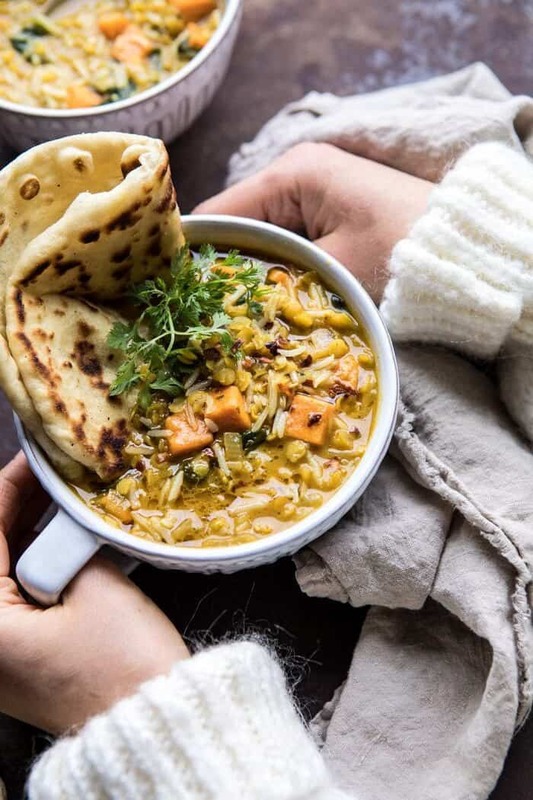 When you’re in need of warming comfort food, but you also want healthy, this Coconut Sweet Potato Lentil Soup with Rice is just the soup to make. 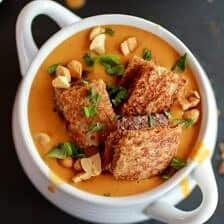 All made in just ONE pot (or in your instant pot), in less than an hour, and using good for us ingredients like sweet potatoes, red lentils, warming spices, and creamy coconut milk. It’s cozy, a little spicy, and filled with vegetables. Finish each bowl off with steamed rice and you’ll have the perfect healthy bowl of soup for lunch or dinner. When I get stuck creatively, I try to look at flavors and foods just slightly out of my comfort zone. I tend to fall back on cozy foods…pastas, creamy soups, and pretty much anything roasted. Those are my go-to’s and very much in my comfort zone. This is why, when I get in a recipe rut, I love to step outside my box, and explore flavors I don’t use as often as I should. Lately all I want to cook is the comfort foods I know and love. Which is totally fine, since I whole heartedly believe that you should make what’s inspiring you. With our cold, snowy weather I’m embracing all the comfort foods…after all, I think it’s what I’m best at! That said, I was ready for a flavor switch up, and decided to explore some Indian inspired recipes. Instead of googling anything, I text my soon to be sister (because my older brother is gettin’ married this summer!). Lyndsie is one of the more well-rounded eaters I know, and great for recipe ideas. She quickly responded with mulligatawny soup. At first I thought she spelled something wrong. But after some googling I discovered that mulligatawny soup is an East Indian curry soup. It’s traditionally made with veggies, sometimes lentils, sometimes apples, and coconut milk. Honestly, I saw a ton of different versions online, so I’m not sure what’s really traditional. The point here is that I drew the inspiration for this soup from mulligatawny soup. 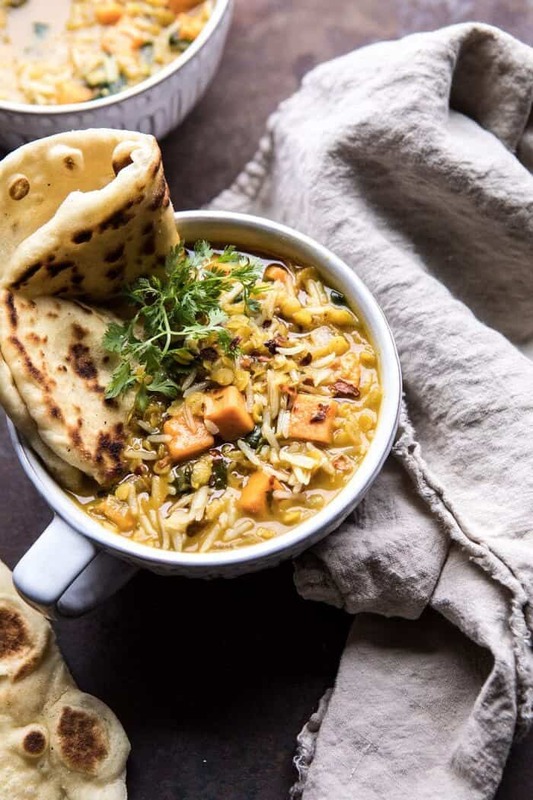 This is not a mulligatawny soup, but it’s similar…ish, and 100% delicious. When I set out to make this soup, I knew it needed to include three things: sweet potatoes, lentils, and rice. I LOVE a rice based soup (have you made my favorite tortilla soup…or my wild rice soup?!). Since I haven’t made one in a bit, I knew using rice for this soup was key. I wanted lentils for protein, and sweet potatoes for, well, just because I love them…and they’re in season! So those were my three must have ingredients. From here I built up the rest of the soup and it quickly came together. You’ll start by cooking up some onions, garlic, and lots of ginger. These are major flavor boosters, so don’t skip them. Then toss in your sweet potatoes, yellow curry powder, and a pinch of cayenne for some heat. Add broth and red lentils, then simmer until the lentils are extra soft, which only takes about 15 minutes or so. You can also do this all in your instant pot (which I included directions for). But I honestly think it’s just as quick and easy to do this on the stove top. Once the lentils are soft, stir in the coconut and some spinach, and simmer to warm through. And like that, the soup is done! I don’t like to add the rice directly to the soup. Instead I add the rice to bowls and then pour the soup over. This way the rice doesn’t soak up all the soup’s broth while it sits. This soup is SO flavorful, SO full of color, and filled with good for us ingredients. Yet it feels totally comforting with the sweet potatoes, creamy coconut milk, and rice. I love serving it with my homemade naan (obviously). It’s our favorite over here. Best part, well aside from all the deliciousness, this requires only one pot and is ready in less than 45 minutes. Perfect. 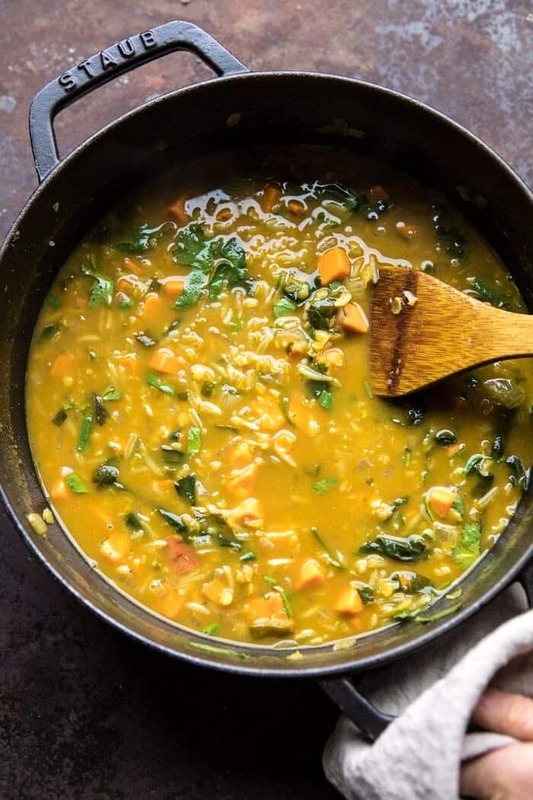 If you make this coconut sweet potato lentil soup please be sure to leave a comment and/or give this recipe a rating! Above all, I love to hear from you guys and always do my best to respond to each and every comment. And of course, if you do make this recipe, don’t forget to also tag me on Instagram! Looking through the photos of recipes you all have made is my favorite! Coconut Sweet Potato Lentil Soup with Rice from Half Baked Harvest on Vimeo. 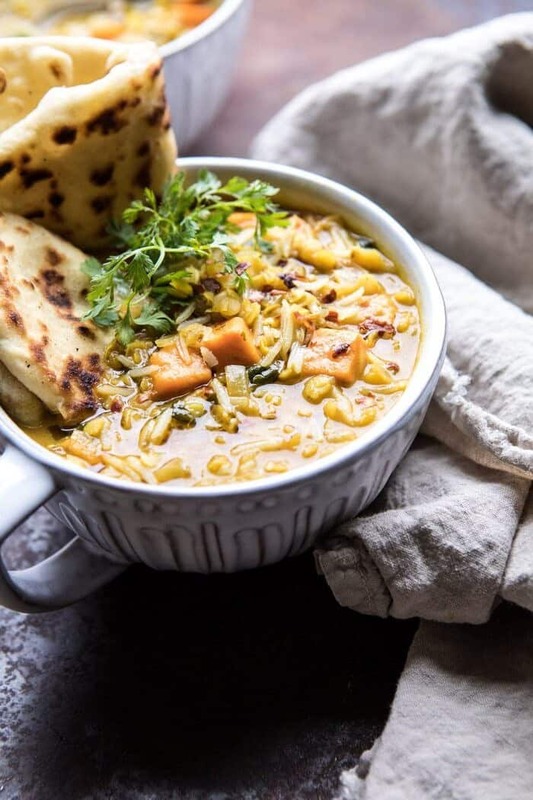 When you're in need of warming comfort food, but you also want healthy, this Coconut Sweet Potato Lentil Soup with Rice is just the soup to make. All made in just ONE pot (or in your instant pot), in less than an hour. It's cozy, a little spicy, and filled with vegetables. 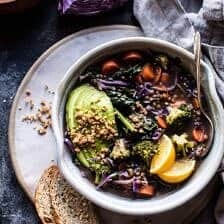 The perfect healthy bowl of soup! 1. Heat the olive oil in a large pot over medium heat. When the oil shimmers, add the onion and cook 5 minutes until soft. Add the ginger, garlic, and sweet potatoes and cook until fragrant, about 2 minutes. Stir in the curry powder and cayenne and cook another minute. 2. Add the broth and lentils. Season generously with salt. Bring the mix to a boil over high heat, then reduce the heat to low. Cover and simmer 15-20 minutes, until the lentils are soft and the sweet potatoes tender. 3. Stir in the coconut milk and spinach, cook 5 minutes. Remove from the heat and add the cilantro. 4. To serve, divide the rice among bowls and ladle the soup overtop. Garnish with cilantro. Serve with Naan on the side. Enjoy! 1. Set Instant pot to sauté. Add the olive oil and onion and cook 5 minutes until soft. Add the ginger, garlic, and sweet potatoes and cook until fragrant, about 2 minutes. Stir in the curry powder and cayenne and cook another minute. 2. Add the broth and lentils. Season generously with salt. Cover, select the manual setting, and cook on high pressure for 10 minutes. 3. Once done cooking, use the quick release function and release the steam. Set the Instant pot to sauté. Stir in the coconut milk and spinach, and cook 5 minutes. Turn the instant pot off. Stir in the cilantro. 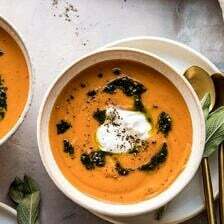 Golden Sweet Potato Soup with Burrata and Sage Pesto. 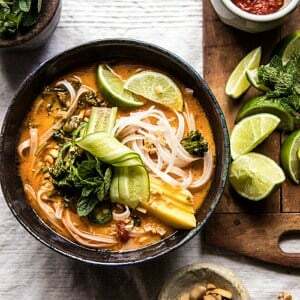 20 Minute Peanut Noodle Soup with Lime Mango. It looks very tasty. Even though it isn’t soup weather here yet. HA! It has been in the 80s most of the fall. Unusually warm for north GA.
Wow that is so warm! Sounds nice haha! I hope you love this when it gets a bit colder, Charlotte! Love this kind of soup, and I especially appreciate the leftovers, which always taste fabulous. This looks so yumm! For those of us who have yet to get an Instant Pot, I assume this would work in a crock pot too? I hope you love this! Thank you Caroline! This looks absolutely magnificent and warming for a cold evening. Given that it’s SUPER freezing where I am (in the 60s…call me a drama queen but that range is INSANELY COLD TO ME! ), I am in dire need of warming foods like soup, roasted vegetables, and curry. The spices, sweet potato, and lentils seriously make this dish so hearty and perfect! I am so with you! I hope you love this soup, Cassie and it warms you up a bit! I made this soup last night, (the day it was published :)) since I had basically all the ingredients in my pantry. I only substituted some thinly sliced kale for the spinach. It was the perfect thing to cook at the end of a long work day – cozy and nourishing, fast and simple. Thank you, Tieghan, for all your work! I am so glad you enjoyed this Vera! And after a long work day, that sounds like the perfect meal! Thank you! This looks amazing and I can’t wait to try it. Any suggestions on cooking the soup with a crock pot instead? Thanks! I am so happy to hear that! Thank you Tracey! I made this tonight and my husband loved it! We used the instant pot and fortunately we have two so one made the rice while the other made this savory, spicyand yet delicately sweet dish. This is a keeper for sure. I am so glad you enjoyed this Noël! Thank you so much! 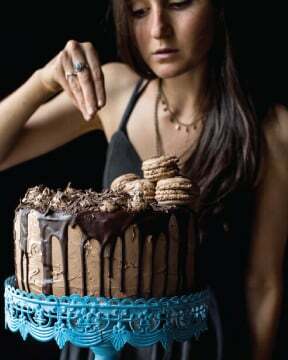 I’m going to make this tomorrow. It looks delish. I just finished eating my first bowl of this soup. Thank you for such a great recipe. It’s my first soup as a vegan. I omitted the rice. I decided that some of the meals I will put it over cooked rice. I am so glad you loved this Cyndy! Thank you so much! Any reason you can’t use a brown lentil instead of red? And are you using dry lentils in your recipe or have they been hydrated already? Made this tonight! It was perfect for 40 degree weather! Thanks for sharing!! Thank you so much Amy! I am so glad you enjoyed this! Hi! I’m so excited to try this- do you think butternut squash could be subbed for the sweet potato? I just have some on hand. Thanks! I love rice and lentil bowls so much! I usual cook them by colour depending of the veggis and spices I put in them and the vibrant yellow colour of this one looks delicious! I made this yesterday and it is wonderful! I used green lentils instead of red since that’s what I had on hand, and had no issues with the replacement. Reheats great for lunch. I just made this and it’s delicious. I ended up using my immersion blender to puree everything but the spinach and cilantro. It’s very warming and cozy. Can’t wait to serve it with warmed naan! Thank you for the recipe! I am so happy to hear that Bailey! Thank you so much! I made this tonight to keep me full and healthy and have a few more servings during the week. Loved it. Was so delicious and savory. I wanted to curl up in it. I made this while visiting my friend in a Lake Tahoe in a crisp fall evening after a days hike. Her diet is vegan and gluten free so u made this sans naan. It was a touch spicy for me but well loved by all. Really easy to throw together in one pot! I am so glad you still loved this Danielle! Thank you! Made this soup last night and put it kn my crock pot for an all nighter. About 8 hours later on low it seriously was so good and since it’s just starting to get chilly it was the best first soup to start off my fall season. Even hubby approved. Thanks for the inspiration. Thank you so much Denece! I am so glad you loved this soup! Added ground turkey to this and it was SO SO GOOD. The flavors/textures were not like anything I’d had in a soup, and everyone loved it! Can’t wait to eat my leftovers for lunch today… make this soup it’s so good! Thank you so much Grace! I am so glad you loved this and hope you enjoy the leftovers! I love that! I am so glad this turned out amazing for you, Megan! Thank you so much! I absolutely love all of your recipes and have been a longtime follower. I have to say, I made this for dinner this week along with your recipe for homemade naan…and Oh-my-goodness! It seriously was maybe the best recipe I’ve made in a long time, and I also love that it’s vegan! Props on another fantastic recipe- you continue to amaze me. Wow I am so happy to hear that Caitlin! Thank you so much! Ummmm, YUM! I made this soup this afternoon and we had it for dinner tonight. I’m not a huge sweet potato person, so I substituted it with butternut squash. I also added quartered mushrooms. My husband said it was the best meal he’s had in a loooooong time. Next time I’ll add just a pinch of cayanne-it was too spicy for our 3 kids. We had cottage cheese on hand -so I added some to the kids bowls to turn down the heat. I was amazed at how simple and easy this was. Perfect for a fall evening. That is so great! I am so glad you loved this recipe, Dea! Thank you so much! Hello! I want to make this but don’t have yellow curry powder but I do have Garam Masala. Do you think that could work? Or Thai curry paste? How much should I use if I sub the paste? Thanks!!! This soup is the best! Easy,quick to make and so delicious. It tasted really good even before adding coconut milk. I loved loved this recipe and will definitely make it again. Thank you again for sharing it, so good. Thank you so much Agne! Mine turned into more of a greenish yellow color. Not the prettiest to look at but not a huge deal. I am thinking the flavors may develop a bit more when I eat the leftovers tonight. If not, I think I will add more curry. Thanks for another recipe! Hi Danielle! Please let me know if it is better after adding more curry. I hope this turns out better for you! Oh. My .Goodness. 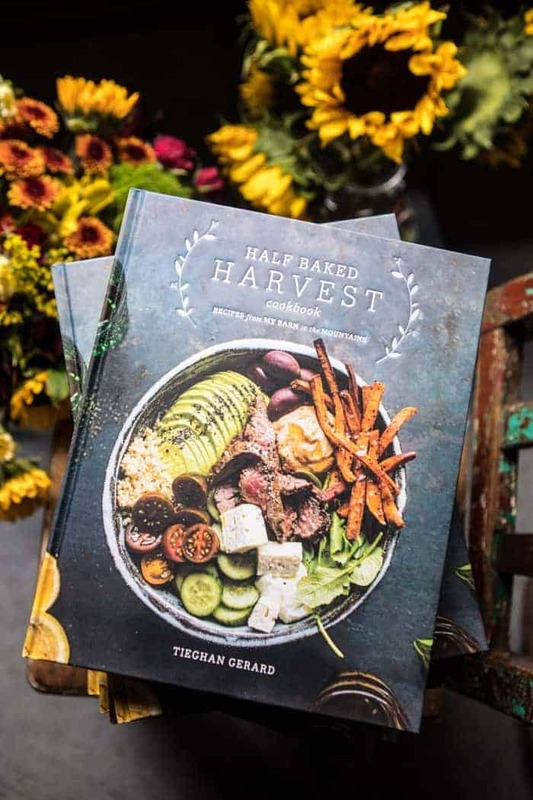 Okay I love all the half baked harvest recipes and treat my cookbook as if it was my first born. BUT WOW. This soup is increidble. Here in Canada it is chilly already and this soup is the perfect thing to keep me warm during study breaks! It is the perfect mix of sweet and spicy. I substituted the sweet potato for candy roaster squash which made the soup a bit thicker… delicious. Thank you! I am so glad you are loving this soup Tessa! This is so perfect for colder weather! Thank you! This recipe was fabulous. I did leave out the cayenne as my husband is sensitive to spicy hot foods and I wasn’t sure how much to use but I didn’t miss it as the flavors were so good otherwise. I am a huge Half Baked Harvest fan and have made dozens of the recipes from the book. They are always a hit! I love the creativity in all your recipes. I made this last night and it did not disappoint – DELICIOUS! I substituted orzo for rice since we are already having rice this week, but I love how thick and creamy and flavorful this was. The sweet potatoes, the curry powder, the coconut milk, such a great flavor mix. Thank you! Thank you so much! I am so glad you have been loving my recipes, especially this one! Hi! Can I substitute green lentils? That’s what I have on hand. Hi Rachel! Yes, that will work! I hope you love this! I am so happy that you and your family loved this recipe, Maria! Thank you so much! I made this on the stove top without substitutions and it’s delicious! Such a great combination of flavors! This is delicious! I made it for lunch on a cold and dreary day last week, and am looking forward to the leftovers. It’s a lot spicier than I anticipated – which is a good thing. I like spice, but usually have to add more than what a lot of recipes call for. I’m glad I tasted first before adding any more! I am so glad you loved this recipe, Kayleigh! Thank you! Very tasty soup. Loved it! Keep them coming! What about using chicken broth? I’ve got so much in my pantry to use up and no veggie broth on hand! 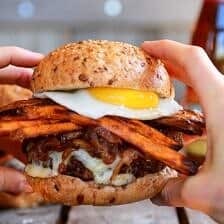 I didn’t know what to make for lunch yesterday so I decided to give this recipe a try, everyone at my house LOVED IT! Perfect for cold and rainy days, also ingredients were really easy to find (I live in Mexico). That is so amazing! I am so glad your family loved this recipe, Blanca! Thank you so much! Wow just wow so simple to make and downright delicious. Thank you Gary! I am so glad you liked this! This was so flavorful and filling! Definitely reccommend! Made this tonight for our first freeze and it was unbelievably perfect. The only thing I did differently is I used an entire onion bc half onions make me sad. So, so good! We made this for dinner prepping everything the night before. Dinner was done in minutes and so delicious! We added jalapenos and then had to add mozzarella cheese because we made it too spicy and those were amazing, too (thought our goal is to eat it cheese free when we can stand the heat). I am so glad you loved this Kait! Thank you so much! I am so glad you loved this and you want to make more from my site! I hope you love all that you try! Thank you Laura! Made this last night and loved it! So flavorful. Perfect for a cold fall day! This soup was great! I made it exactly as your recipe states except I only used 1/8 tsp of cayenne, because I was sharing with some sissies. Anyway, it was truly outstanding, and I will make it again because these are some of my favorite food items, too. Next on the list will be the chicken, which really does look great. Thank you for sharing your talents and skills. I am so glad you loved this Jeani! Thank you for trying out this recipe! This sounds great. I have everything to make it, so this will be dinner tonight. But, why peel the sweet potatoes? The peels are the most nutritious part of the potatoes. After boiling, they’ll break down and you won’t even notice them in the soup! This was sooooooo good!! Making it this week the night my family gets into town! Happy Thanksgiving! Thank you Alexis! I am so glad you liked this and hope it turns out amazing for you family! Happy Thanksgiving to you as well! This soup was awesome! We ate it for two days and loved it both times. We will definitely make it again and again. I am SO happy to hear that! Thank you so much Diane! I made this last night for my husband, who sometimes wonders where the meat is when I make vegetarian dishes. But he loved it! It was hearty and filling – great for a cold Autumn night! Thank you so much! This is so perfect for a cold night and I hope you love it Faith! I am always a little nervous to make Indian food, as it seems I can never get it quite right. But this was so easy to make and turned out delicious! A cheaper and healthier option than takeout. Serving with naan is definitely necessary. Thank you so much Meg! I am so glad this turned out so well for you! I made this on a Sunday for my husband and I. It made a quick dinner, and then we had plenty of leftovers for several lunches throughout the week. It was delicious! I’ll definitely be making again, but with a little less cayenne next time. Thank you so much Regan! I am so glad you loved recipe! I made this over the weekend. Amazing! I loved it. I am so glad this turned out amazing for you, emily! Thank you! I made this the other day and it was sooooooooo good! I wouldn’t change a thing! GREAT recipe! Thank you Lisa! I am so glad you loved this! So tasty and love how healthy it is. Made this last week and it was so good!! I am so happy to hear that! Thank you Lindsey! My boyfriend is from Nepal so we eat a lot of lentils and I’m always looking for a new way to use them. 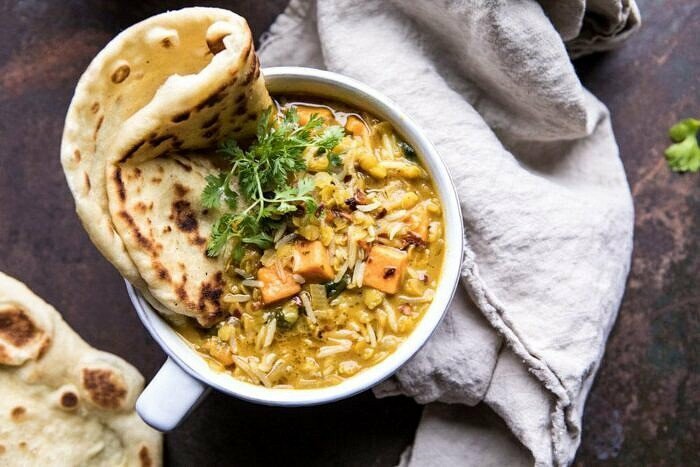 I made this with barley and homemade roti and we both loved it! Thanks for sharing! I am so glad you loved this, Summer! Thank you! This is one of my favorite recipes from HBH! It’s incredibly delicious and so healthful. It fills you up in the best way. I can’t recommend this one enough! Hello! I am considering making this for my husband and me this coming week in our Instant Pot. Do you think chicken breast could be added? He is a pretty staunch believer that there should be a meat in every meal 🙂 How would adding two cubeb and thawed chicken breasts change the time in the instant pot? I love this recipe! So warm and cozy. I think next time i’d add more lentils, because they are my favorite and i can never have enough. 🙂 Thanks for another great one! 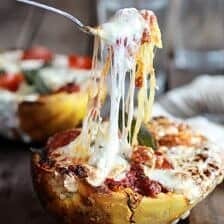 How would I make this in the slow cooker? How can I adjust this for a slow cooker? Can you use regular lentils? Hi Barb! Most regular lentils come dry in the bulk food bins or in bags at the grocery store. Is that what you’re also referring to by regular lentils? This is incredible! I honestly wouldn’t change a thing. I’m so excited to have a new recipe in rotation!! 4 out of 5 people in my family are not adventurous with food. 5 out of 5 LOVED this. We added some cashews at the end, but otherwise followed the recipe exactly. Thank you so much! This is a keeper! I am so happy to hear that! Thank you so much Julie! This soup is so addicting! It is on our regular rotation and we can’t get enough! I am so glad you loved this Kathryn! Thank you! Running a victory lap around the kitchen island! This was great. Omitted the greenery in hopes to have have better reception from the picky children. Husband loved it! I had regular lentils on hand so I used those. Added a pinch of cinnamon and tumeric but otherwise followed the recipe as is. Thank you! I never get to knock out out of the park! I am so glad you all enjoyed this! Thank you so much Mandi! I used brown rice since I didn’t have any basmati, and I used half the amount of red pepper, as I didn’t want it too spicy. Otherwise, I followed the recipe as written, and I don’t have words to describe how delicious and cozy this meal is! I will definitely have this in the regular rotation during cold Michigan winters. Make it folks, this is a winner! I am so glad you enjoyed this recipe Laurie! Thank you so much! This looks SO delicious!! I’m not a big fan of cilantro though – is there another herb that would work well in this? Thanks!! Giving this one star because 1/2 teaspoon cayenne pepper is WAY too much. Once in there you can’t take it back :-(. I’m a fan of both spicy heat and HBH. I’ve made several HBH recipes so I followed this recipe as written though I should have followed my instincts. I suggest starting with an 1/8 of a teaspoon and adjust to taste. Spare your palate by cutting back and save the pot of soup which has promise to be very comforting. Hi Diane! I am so sorry that this was too much heat for you. I hope you try this again with the spice level you like and enjoy it! Thank you! So good! I used red curry paste as I don’t care for yellow curry but it’s fantastic! Thanks! Last night I made this recipe per the stove top instructions and it was awesome! Most delicious curry dish I’ve made yet. I noticed, however, that the red lentils completely dissolved into the soup. Is this intentional? 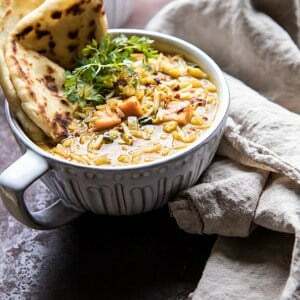 Are the lentils intended to give body to the soup and serve a thickener? Or, should have they remained whole and perhaps I added them too early? 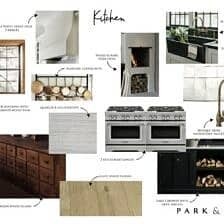 Thanks – love your recipes! Can I use brown rice or nah? Could you recommend a crispy topping? Maybe crispy chickpeas? Hi Soohie! Crispy chickpeas would be amazing! I hope you love this! Thank you so much Danita! I am so glad you loved this! So freaking good. I rarely eat leftovers more than one day. I ate this for lunch and dinner 3 days in a row. Thank you for this delicious recipe! Yum! Thank you so much Corie! I am so glad you loved this! This was so yummy! I omitted some of the heat and used the immersion blender to blend the veggies so that the kids wouldn’t be able to pick them out and it was a hit! Thanks! I am so glad everyone loved this Jessica! Thank you! This is the epitome of comfort food that is healthy as well. My gosh I mean what else is there to say besides this is incredible, especially when paired with her homemade naan (which by the way cooks gluten free amazingly.) Why am I not surprised this is amazing? I’ve tried a lot of her recipes and every single one so far has yet to disappoint. Thanks for all the new meal staples in my home! This is also kid friendly if anyone was wondering. My boy gobbles it up. You’re too sweet Claire! 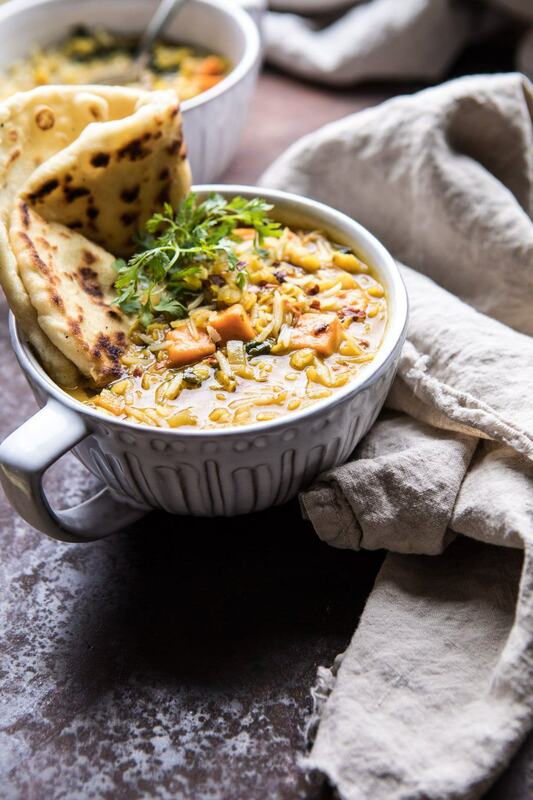 I am so glad you loved this soup and with the homemade naan! Thank you so much! This was one of the first recipes I tried in the Instant Pot, and is now a family favorite. My family has so many food sensitivities and we can all eat this soup. Thank you so very much! I am so glad you all loved this Laura! Thank you! I made this today and used 1/2 teaspoon of cayenne without thinking to start with a little less… just a first taste without the rice yet it seems a bit spicy. Do you have a recommendation of how to tone down the heat a little. Thanks so much! This was so easy and yummy! I’ll definitely be coming back to this recipe through the winter! I forgot to get rice but a a nice loaf of bread and it was great…next time I want to try your naan recipe! Thanks so much for posting….your recipes are always amazing!! I am so glad you loved this Lindsay! 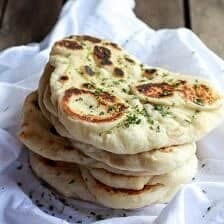 I hope you do try the naan, its one of my favorites! Thank you so much! Second time making this soup! So flavorful and so filling. One batch on Sunday with rice fed up for three nights. Added celery and carrots. Thanks for the great recipe! Thank you so much Kelly! I am so glad you loved this! Hi Tieghan – I make so many dishes of yours each week and so enjoy looking over all your recipes! I am a devoted follower! But this curry! I think this may be the best thing I’ve ever made! And by far is one of your easier dishes to make! Thank you for this bowl of delicious heavenly goodness and thank you for continuing to contribute to the world, making my world so interesting and healthy and creative! Wow that is so amazing! I am so glad you loved this recipe Lara! Thank you so much! My husband and I loved this recipe! Will definitely make this again! Absolutely delicious! Our new favorite recipe! We get so stuck on our regular weekly recipes, it’s so nice to add something new and delicious to our rotation! This was so good!!!!! Definitely a keeper! So easy to make!! Thank you for this awesome recipe!!! Great soup! Made homemade flatbread to go with it. Yummy! Tried to post picture but ??? Hi Sue! I am so glad you loved this soup and it turned out amazing! Thank you! If you try to post a photo in the comments, most times you need to turn it into a URL address! So, so, so good! I used half the coconut milk because I’m trying to take it easy on saturated fat and it was still so luxuriously delicious. I made it with the intsant pot and the sweet potatoes were like silk at the end. I also only had frozen chopped spinach and I just tossed in a bunch toward the end. Perfect. I’m sure it will taste even better with fresh baby greens. I’ll be making this over and over! Thank you! This soup is soo yummy!! Smells delicious, looks delicious, AND feels healthy! I love that I know everything I put in isn’t processed. Thanks so much for sharing 🙂 I don’t have Instagram but I’ll post my picture on Pinterest. Loved this soup tonight. Mine came out much thicker than what your photos look like, but everyone ate it and loved it regardless! My naan on the other hand wasn’t too great, but I’ll try that recipe again before I give up! This soup is absolutely delicious!!!! My favorite soup ever made! Thanks for the recipe! Made this last night in my instant pot and it was delicious! I only used a pinch of cayenne so that it wasn’t too spicy for my toddler but otherwise followed the recipe. Super easy and delicious. Definitely will be making again. Double the lentils, tear the spinach, add lime, and more cayenne. This was unbelievably delicious! Even my kids are it without any complaints! This is going in the rotation for regular meals. Made this last night for dinner in my instantpot. It turned out ok? The flavor was good, but everything ended up mushed together. The lentils had disappeared into the soup, as had most of the sweet potatoes. I can’t tell if it was supposed to turn out like that or not. Glad I made some rice for texture. But as I said, the flavor was good. Liked the bite of the cayenne in there. Next time maybe I’d try 8 min in the instantpot instead of the full 10 min.